"I don't want to play with girls...GIRLS ARE STUPID!" Unfortunately, these words haven't been uncommon ones in our house over the last few months. 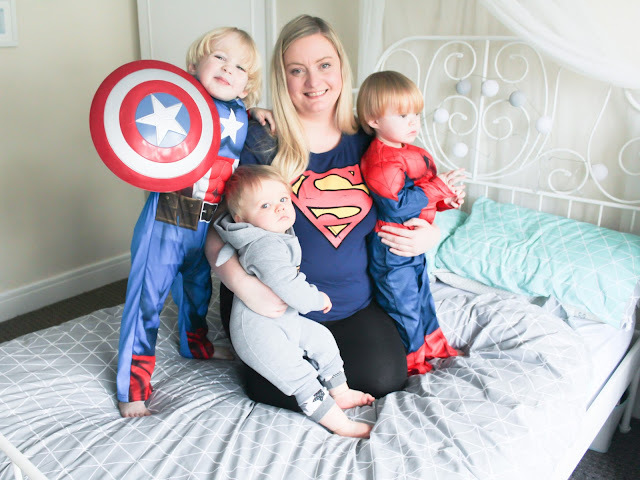 I'm a mum to three little boys, and as my firstborn son has got older, I've noticed the change in his attitude towards females more and more. I remember the first time he noticed sexism...he was only around 2 years old, and he saw an advert for a Peppa Pig toy on TV. It was something to do with the nursery rhyme "Ring O Roses" and all of the children playing with it in the advert were girls. I didn't think anything of it, until my sons tiny voice piped up and said "I want that toy Mummy...it's just for girls though"
Of course I tried to tell him it wasn't. I told him it was just a silly advert and it didn't matter who played with it. I even bought him the toy! Months later I noticed the advert had been changed to include a boy. But it was too late, the damage had been done. From then on, Tyne seemed very aware of which toys were stereotypically for "boys" or "girls" despite our insistence that he could play with anything he wanted to. Then when he was around 3 years old, he'd suddenly started to act embarrassed if he was offered a female Playmobil figure to play with and would throw it back shouting something like "No that's a girl! I don't like girls!" It never seemed to matter how much I reminded him of all of the females in his life that he did indeed like....his older cousins, his Grandma, his aunty, Me!...he still insisted he didn't want to play with the female figures. I never pushed the matter, I didn't want to make it a "thing"...instead I watched and waited. To see how things progressed. Hopeful that it was just a phase that he'd grow out of. Instead I started to notice it get more apparent - he started to complain whenever there were female characters in his favourite TV shows, if a Scooby-Doo episode focused more on Daphne and Velma for example he'd declare it boring and go off in a huff. I tried to sit and discuss it with him, but the answer I got was always the same - "girls are rubbish! Boys are best!" I honestly don't know where this came from. He has never spent much time in nurseries or at school, he's been home schooled for most of his life and I'd doubt that just a few short weeks spent at school could have started this in him. He doesn't see or hear this sort of thing at home - infact the traditional gender roles are reversed in our house with me being the main breadwinner and his Dad being the one taking on the homemaker role. He sees his dad do the dishes and the laundry more than he sees me do it, we both do the cooking and cleaning. So where did it come from? Where was he exposed to these outdated attitudes?! Who knows! Typical 5 year old behaviour? Perhaps. To be expected? Maybe. Just a phase? Hopefully so. But as his mother, I'm just not prepared to take that chance. A few weeks ago it was International Women's Day, and I watched on across my social media channels as the many Girl Mamas I know spoke of their mission to raise strong, independent females of the future. Something I admire and support. But it made me think...despite the fact that I'm a mother of all boys, I still have a part to play in this. It's my job to teach my sons about the importance of equality. The importance of body autonomy. The importance of women's rights. The importance of respect. And it starts right here, right now. With my apparently girl-phobic 4 year old son. I don't want to just sit by and hope he grows out of it. I don't want to just assume it's a phase. I want to be pro-active. I want to help him to learn and grow in all areas of life. And if he has any prejudices, I want to challenge them...to help him to look at things from a different perspective, to help him learn how to see beyond his own circumstances and look at somebody else's. In short, I want to do whatever I can to ensure that I'm raising good people. With that in mind, last week we started a new home ed project focused on Great Women Of History. I bought a book by Kate Pankhurst entitled Fantastically Great Women Who Changed The World and on Sunday afternoon - we sat down together to read it. When we started our session, Tyne wasn't exactly enthusiastic about it. He'd rather have spent our time focusing on one of his World War 2 projects I'm sure...but he knows that when I get a bee in my bonnet about something that he's not going to get away with it, so he knuckled down and we got on with reading the book. Each page contained some background story and key facts about the achievements of different women from years gone by - from the sporting and adventuring achievements of the likes of Gertrude Ederle (First woman to swim the English channel) and Amelia Earhart, to the incredible discoveries of scientists like Marie Curie and Mary Anning along with Frida Kahlo, Sacagawea, Coco Chanel, Mary Seacole and many others. Tyne's interest seemed to grow with each page we read, and at the end when I asked him to choose whose story he had found most interesting - he told me, in his own words, "I can't choose just one...they're all so interesting"
This was a pretty huge turnaround for the boy who happily declared that "all girls are stupid" only hours before! He struggled to decide who's story had impressed him most - being stuck between Emmeline Pankhurst (who I really hadn't expected him to be all that interested in since I hadn't expected a 4 year old to grasp the importance of the vote but he was completely enthralled by her story...asking me questions such as "Can men still vote as well as women now?" and "What about children? Shouldn't we be able to vote? "), Anne Frank (I told him about the time I'd visited the Anne Frank house myself, and now he wants to visit too!) and Rosa Parks. "It's pretty cool how women do such amazing things, even better than men sometimes. Do you know what mummy, I think it doesn't matter if you're a boy or a girl..."
That evening I ordered some more reading materials for us to continue our quest to quash the gender stereotypes - Good Night Stories for Rebel Girls , Stories for Boys Who Dare to be Different and Fantastically Great Women Who Made History - and I'm excited to see how my little people take to them. My boys will grow up learning to look after themselves, to cook and to clean, to understand money and to understand the importance of working hard, being kind and being a decent human being. I might not be able to stop them from being exposed to gender stereotypes and outdated points of views in the big wide world, but I can do my bit to make sure that at home they are exposed to strong and positive role models from all walks of life. Who knows, perhaps if we all do our bit to make sure that we're raising children free from stereotypes, there'll be hope for a better future for all of them yet.